Hydroponics is a great way to easily grow flowers indoors. It provides a means to enjoying their beauty without having to worry about obtaining soil or keeping soil at a specific balance. If you’ve ever wanted to bring flowers into your home (perhaps even edible flowers), but don’t want to set aside a lot of time or space for them, consider growing blooms hydroponically. The following is a guide to growing flowers indoors using hydroponics. 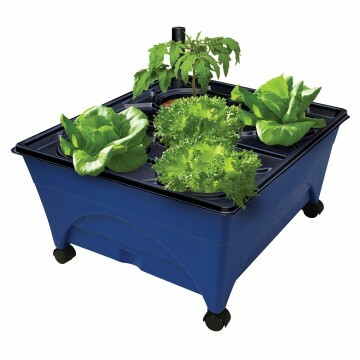 Hydroponics is a way of growing flowers (and fruits, veggies, and herbs) with water. A perfect hydroponic system also utilizes a substrate and a nutrient-rich solution to keep flowers thriving, in often less space than a traditional soil medium requires. When you grow flowers using hydroponic methods, you can use a variety of containers, so there’s bound to be one that will look nice in your home. The main advantage of growing flowers hydroponically is that you don’t have to deal with annoying aspects of gardening, such as weeds. Only your lovely flowers will fill your pots or jars. Along with weed-free gardens, hydroponic gardens can easily be grown upright (vertical gardening) to preserve space. They’re not messy and they actually take up far less water than traditional soil-based gardens. The primary disadvantages of growing hydroponic gardens is the initial time and cost of setting up your garden, but after you’ve tacked this, it’s usually smooth sailing. It will take a bit of research to learn how to grown a strong hydroponic flower garden, and you’ll soon learn that not all flowers are suited for this type of growing environment. But, there are tons that are. Just set aside some time to play around with what works and what doesn’t, then you’ll reap the rewards of a beautiful indoor garden. There are several techniques to growing hydroponic flower gardens indoors. What’s best for you will depend on the time you have to research and set up your garden, your space, your budget, and your visual preferences. Some hydroponic gardeners like using an ebb and flow technique, which utilizes an automatized system for root coverage and draining. Others prefer the drip method so that they can stake tubes to each plant and easily supply the correct amount of nutrient fluid. The mist system is specially designed to cover plants with an oxygenated mist that moistens and nourishes the entire flower, stem, and root. For a simple, out-of-the-box and ready-to-go solution to growing flowers indoors through hydroponics, consider this set up from Emsco Group. Hydroponics is a great way to easily grow flowers indoors. It provides a means to enjoying their beauty without having to worry about obtaining soil or keeping soil at a specific balance.If you’ve ever wanted to bring flowers into your home (perhaps even edible flowers), but don’t want to set aside a lot of time or space for them, consider growing blooms hydroponically.